Replacement Filter Cartridges for Vac-50, 45 & 40 Skat Blast Vacuums and 180-DC & 310-DC Dust Collectors. 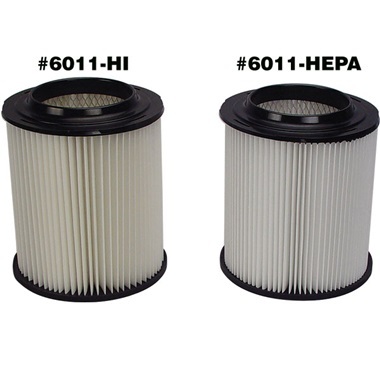 HEPA Filter Cartridges for Vac-50, 45 & 40 Vacuums and 180-DC & 310-DC Dust Collectors - Trap any ultra-fine dust particles down to 0.3 microns (particles about 1/300th the diameter of a strand of hair) and keep 99.97% dust inside the vac and out of your shop! The ultra-fine filtration prevents vacuum motor failure caused by dust entering the motor. Non-stick filter membrane resists clogging - dust and dirt simply fall off the filter surface before it can build up. Washable, air-dry type. 8"H, 7-1/4"Dia. #6011-HI (Import) - Most popular. Standard with Vac-50, 45 & 40 Vacuums. #6011-HEPA (Made in USA) - Standard with 180-DC & 310-DC Dust Collectors, and optional replacement for Vac-50, 45 & 40 Vacuums.